The players are the same, the ball is still round, and the basket is still 10-feet tall. Yet all of the sudden the Trojans can score. The only difference is a new coach. Through the first three games under interim coach Bob Cantu, the Trojans averaged 79 points per game, compared to 64 points per night in 17 games under Kevin O’Neill. Against Arizona State the USC offense exploded for 93 points, the most points the Trojans scored in a game since O.J. Mayo donned Cardinal and Gold. USC scored a season-low 50 points against No. 6 Arizona on Saturday, but through four games under Cantu, the Trojans are still averaging nearly eight more points than they did under O’Neill. The biggest beneficiaries of USC’s free-flowing offense under Cantu have been the guards. J.T. Terrell has been given the green light to shoot, and has averaged 2.7 more shot attempts per game under Cantu than O’Neill. 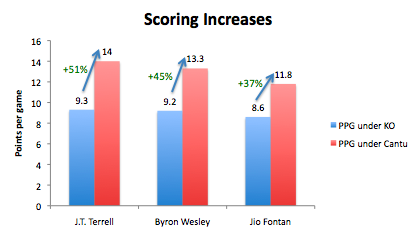 Byron Wesley and Jio Fontan, arguably USC’s two best slashers, have gotten to the basket more. Post players, meanwhile, have struggled under Cantu. After scoring in double figures in O’Neill’s final five games, Dedmon has not scored more than eight points in a game under Cantu. Omar Oraby, meanwhile, averaged 8.9 points during O’Neill’s final seven games. He has scored only 12 total points in four games under Cantu. 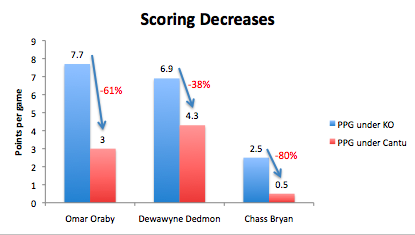 Neither Dedmon nor Oraby scored a point against Arizona. Oraby, despite being 7-foot-2, failed to grab a rebound in 18 minutes against Oregon and 12 minutes against Arizona. Gotta love Microsoft Excel… great work bud. I wonder how the shot distribution has played out over the last few weeks. I got to think that Wesley and Wise are also taking more shots, while Oraby is not because he keeps missing those free throws.